Peter does a phenomenal job conveying his passion for music and his love of the outdoors. He’s the ideal spokesperson for Monster as we launch products that deliver unprecedented outdoor sound. 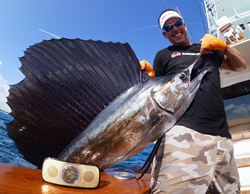 Monster®, the world leader in personal audio, is proud to welcome Peter Miller, Emmy-nominated, nationally-renowned television host, producer, spokesperson, philanthropist, professional angler and world champion fisherman, on board as the company’s latest Monster VIP Partner. An expert fisherman with a lifelong passion for both music and the ocean, Miller is an ideal partner. Monster will help to cross promote Peter Miller’s brand in sales channel development and integration through Monster’s global worldwide network. Visit Peter Miller’s Monster site to learn more. Peter will help to promote a variety of Monster products, including the splash-proof SuperStar™BackFloat™, the floating wireless speaker with a durable silicone shock proof shell designed for all-weather outdoor use – ideal for fishing and other aquatic sports. Miller will also help promote the popular Monster Blaster outdoor Bluetooth speaker with deep pounding bass which has the power to bring music to outdoor life (the boombox redesigned for the 21st century) and the stylish high-performance Elements headphones. At the annual Consumer Electronics Show (CES), Miller was on hand at the Monster booth, sporting images from his television show that feature Monster speakers, specifically SuperStar™ BackFloat™ which also features built-in mics that offer speakerphones for crystal clear conference calls. Here’s a video of Head Monster Noel Lee introducing Peter Miller at the 2017 CES Press conference. Monster has also sponsored Miller’s seven-time Telly award winning television show, Bass 2 Billfish with Peter Miller, which appears weekly on NBC Sports and the World Fishing Network. The Telly Awards, now in its 37th year, honors the best in film and video productions, groundbreaking online video content, and outstanding local, regional, and cable TV commercials and programs. Miller’s highly popular fishing show is now in filming and production for its impressive eighth season.